Each year, more than 650,000 whales, dolphins, and other marine mammals are caught or seriously injured in fishing gear around the world. Entangled in nets, wrapped in fishing lines, or snagged on fishing hooks, these animals either drown or are hauled up and then tossed back overboard—often with life-threatening injuries—as unwanted “bycatch.” Since 1973, the Marine Mammal Protection Act has required that countries exporting fish to the lucrative U.S. market demonstrate that their fisheries are meeting U.S. standards for protecting dolphins and whales. This provision of law has never been implemented, even after NRDC and other groups played nice by asking the government more than six years ago to put implementing regulations in place. Well, we’ve waited long enough; the government has failed to implement the law and today NRDC—with the Center for Biological Diversity and the Turtle Island Restoration Network—filed a lawsuit in the Court of International Trade to force the government to do its job. 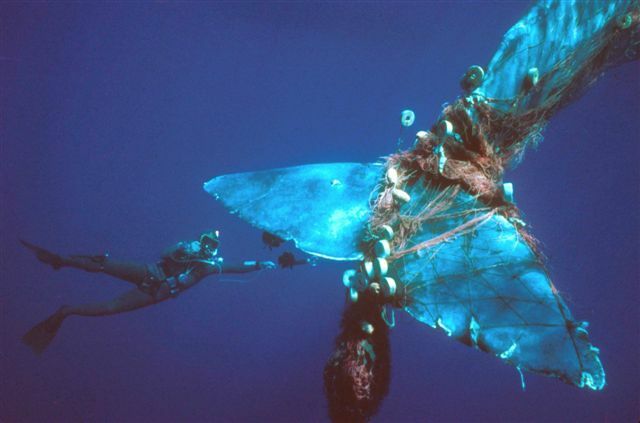 As NRDC showed in its report, Net Loss: The Killing of Marine Mammals in Foreign Fisheries, numerous marine mammal populations are threatened by fishing gear, including the Gulf of California’s critically imperiled vaquita, the endangered North Atlantic right whale, spinner dolphins in the Indian Ocean, sperm whales in the Mediterranean, and false killer whales off of Hawaii. Too many foreign commercial fishing fleets operate without any whale protection protocols. Some fleets fail to even document how many endangered animals are caught. For marine mammal populations, the problem is truly global, with at least 75 percent of all toothed whales species (like dolphins and porpoises), nearly 65 percent of baleen whale species (like humpback and right whales), and more than 65% of pinniped species (like sea lions) suffering from gillnet bycatch over the past 20 years. While not perfect, U.S. fishermen are required to take steps to protect marine mammals by modifying their fishing gear or avoiding marine mammal hot-spots. Under the law, similar steps must be taken by foreign fleets seeking to sell their fish in the United States. But, with the United States failing to implement this requirement, nearly half of the seafood consumed in the United States is not required to show that it was caught in a manner meeting U.S. whale and dolphin standards. While draft regulations to implement this provision of the Marine Mammal Protection Act have been circulating within the government for years, this lawsuit seeks to ensure that those regulations are finalized as soon as possible so marine mammals, fishermen, and American consumers can start benefiting from this important provision. It’s time for the government to act. Since conservation organizations asked the government to implement this provision six years ago, nearly 4 million marine mammals around the globe have been killed or seriously injured after coming in contact with fishing gear. That is a number that shocks the conscience. Struggling marine mammal populations around the globe can’t afford six more years of delay. I look forward to keeping you updated as this important litigation moves forward.